So what's a northwestern? A Canadian western, dummy! 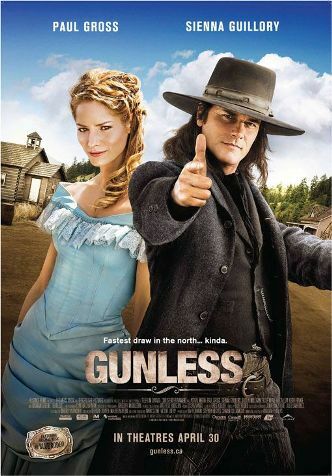 In GUNLESS, the 2010 movie from writer/director William Phillips, much mild but generally charming fun is made of Canadian-American differences, beginning with the main character, The Wyoming Kid, played by that very good actor Paul Gross (yes, of Slings and Arrows and Wilby Wonderful), who, movie comedy-wise, makes a sterling entrance on his horse to begin this quietly funny little film. Writer/director Phillips, shown at right (whose earlier, award-nominated film Treed Murray I would really like to see. 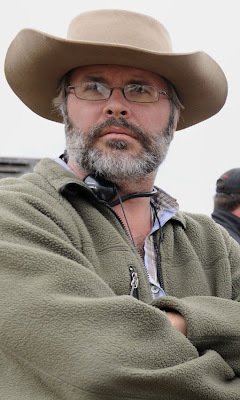 It sounds fascinating, and you can "save" it in your Netflix queue under the new title Get Down), here offers a low-key comic western in which a notorious American gunfighter arrives in a tiny Canadian town, ready to roll, only to find that nobody is the least bit interested in drawing against him. (This is a movie the NRA would most likely rise up against, if that organization even knew the film existed. But the NRA has never been much interested in independent film, let alone independent thinking.) The townspeople here generally like and help each other, and they expect that newcomers will do the same. Quaint. But sweet. Mr. Gross, shown above and below, is a good-looking actor with charm and smarts who generally carries off any movie or TV show in which he appears. So it is here. 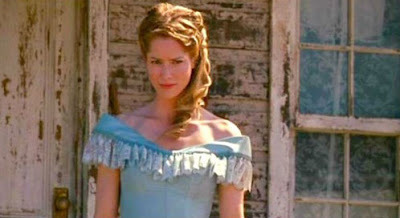 He is paired well with Ms Guillory, below, who proves feisty and beautiful enough to attract and hold our hero. The story, which is barely there, manages to hold the film together, as the many fine performers on hand -- some of Canada's best character actors -- strut their stuff. 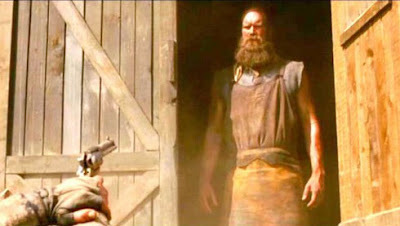 Chief among these is the hulking Tyler Mane (below). delightfully deadpan as the town's gun-shy blacksmith, and there are plenty of others to surround him. 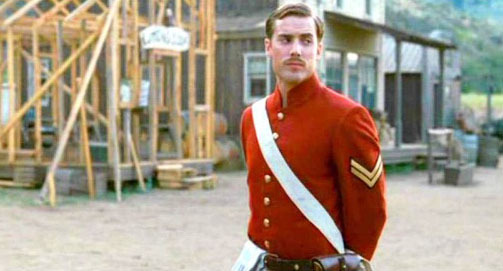 The bad guys, such as they are, are led by another Canuck staple, Callum Keith Rennie, with Dustin Milligan (below) doing a nice turn as a Canadian Mountie. No great shakes in any department, the movie still manages to entertain and charm, and has been available via Netflix almost since its streaming began. In fact, I've has it in my queue since I began subscribing to the streaming process, and decided today to finally give it a shot. I'm glad I did. 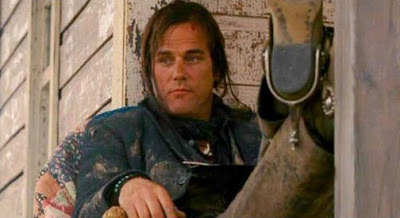 Comedy westerns are not the easiest thing to carry off (seen Cat Ballou lately? And that was considered one of the most successful of this sub-genre), so Gunless' refusal to push too hard proves a smart move.